In late 2009, I got a phone call—followed shortly by a non-disclosure agreement sent via email—from Fred Kiekhaefer, then president of Mercury Racing in Fond du Lac, Wis. More animated than usual, and that’s saying something, Kiekhaefer had a proposition for me. But he couldn’t say more until I signed and returned the NDA, which I did. Turned out that Mercury Racing was going to introduce its first quad cam four valve, turbocharged engine, a 1,350-hp techno-beast that would change the world of high-performance marine power and propulsion in in the most profound way since the introduction of the stern drive. The engine would debut at the 2010 Miami International Boat Show in the latest Cigarette Racing Team-AMG creation, Kiekhaefer told me, and I was getting the exclusive. Unveiled in Miami in 2017, the 860 is least powerful and only naturally aspirated engine currently in the QC4v line. Photo by Pete Boden/Shoot 2 Thrill Pix. So for the next few weeks, I spent many hours on the phone with Kiekhaefer and Skip Braver, the owner and chief executive officer of Opa-Locka, Fla.-based Cigarette. When the show opened, the news of the Mercury Racing 1350 story broke on speedonthewater.com, while a feature article on the entire QC4v engine and Cigarette-AMG project was published in Cigarette’s exquisitely produced Smokin’ magazine. Within a year, twin 1350s became the powerplants of choice for exotic high-performance catamarans and V-bottoms. Was it perfectly reliable? Of course not—no engine platform ever is. But it was a whole lot more reliable—and eliminated the dreaded “turbo lag” that previously made turbocharging less than coveted in marine engine applications—than other high-performance marine engines of similar power levels. That Mercury was releasing a $200,000-plus engine-and-drive package—the 1350 produced so much propeller-shaft-snapping torque that the company had to develop the new M8 drive and new props to handle it—was bold just two years after the Great Recession of 2008 had devastated the powerboating world. Then again, the project had been in development for years with millions of dollars spent in research, design, engineering and prototyping. Shelving the 1350 was not an option, at least not a good one. But Mercury Racing was just getting started. The following year, the company released an 1,100-hp version. Two years later, Mercury Racing went big with a 1,650-hp QC4v mill, a pair of which debuted in the Miss GEICO team’s offshore raceboat. Introduced as an engine “sold only for racing purposes” as reflected by its minimal warranty protection, the 1650 quickly found its way into high-performance pleasure boats, though not nearly at the rate of the somewhat more-affordable and less mechanically temperamental 1350. 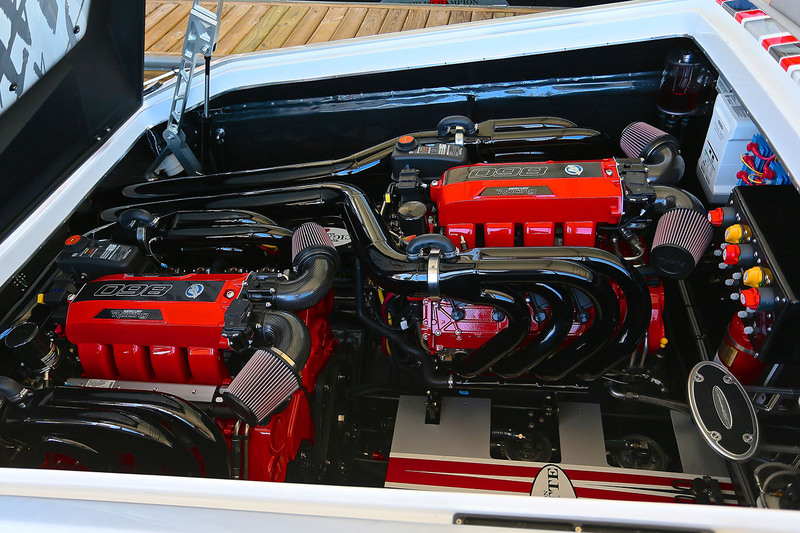 Last year, Mercury Racing introduced the dual calibration 1350/1100 engine at the Miami International Boat Show. In 2015, Mercury Racing introduced its first dual-calibration QC4v product, the 1550/1350. The dual calibration format was a hit with buyers frustrated by the challenge of finding the kind of high-octane fuel the engine required to run in maximum power mode. That turned out to be a particularly good year for the company, as it also unveiled its Verado 400R outboard engine. Two years later in 2017, Mercury Racing was at it again with the 860, its first naturally aspirated QC4v engine. In contrast to the lowest power offering based on that platform, the company also released the 1750, the most powerful product based on that platform that year. 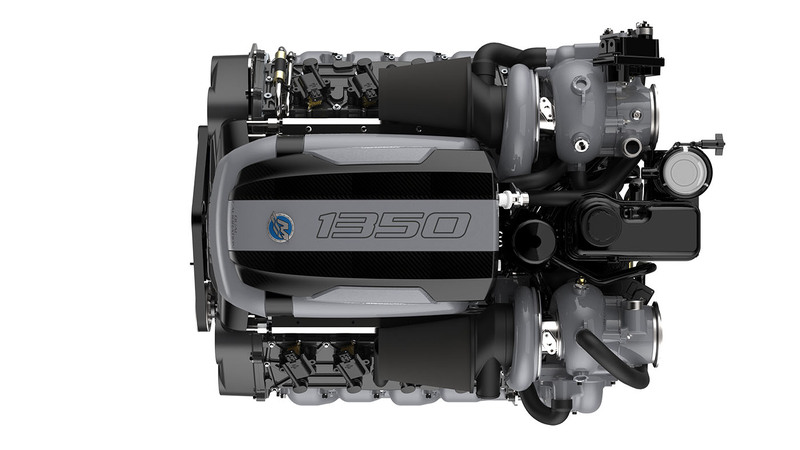 In 2018, Mercury Racing debuted another dual calibration engine called the 1350/1100. Did I mention that all of these engines were unveiled at the Miami International Boat Show? Say what you will about the location on Virginia Key since 2015—it’s a pain to get to and I don’t see that changing for this year’s event, which runs Feb. 14-18. I’m also pretty sure that the show’s generally miserable, overpriced food will return. And long before you reach the main entrance, at least a dozen security folks will order you not to cross the street anywhere near it. And yet—the Miami Boat Show presents a showcase like no other. Strolling down Miami memory lane of the QC4v engine line progression reminded me of that and leaves me eager to see what’s in store for those of us attending the show next month. As for what Mercury Racing plans to bring, I have no idea right now and public speculation isn’t a luxury I have. But I can’t wait to find out and report it.